Since its addition to our garden in 2009 ‘Powis Castle’ artemisia has proved to be a powerful perennial plant for foliage! 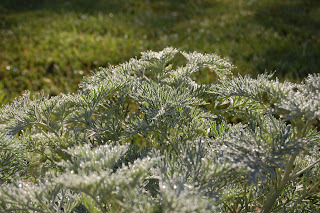 I’ve always enjoyed artemisias for the silver foliage and really liked the ‘Silver Mound’ artemisia that we put in the front sidewalk garden so once I found this cultivar at a local nursery I thought I would give it a try. It spread to an area of 5 feet wide in its first season in the ground. ‘Powis Castle’ is more stout than tall. It may be 18-24″ tall right now and might get up to 3 feet tall. For a nice combination of plants I added it into our birdbath garden as a companion plant for some ‘Mystic Spires’ Salvia. 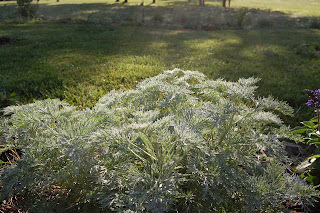 The artemisia began taking over the location and almost completely crowded out the salvia. Truthfully I don’t mind if it takes over because it looks really cool. A little planting advice: give it some space! 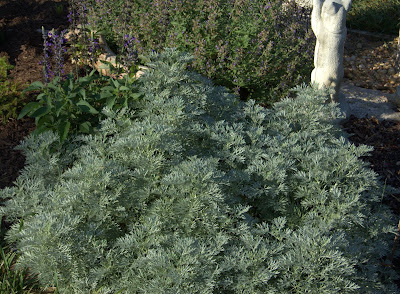 ‘Powis Castle’ Artemisia is a great perennial for zones 6-8 and likes a full sun location but can take partial shade. It can grow up to 3 feet tall with a diameter of 3-6 feet. Very impressive! Its flowers are insignificant and won’t produce viable seed that will be true to the parent plant. All new plants of ‘Powis Castle’ come from cuttings. If your choice is pruning in the fall or spring, prune in the spring just before new growth occurs. 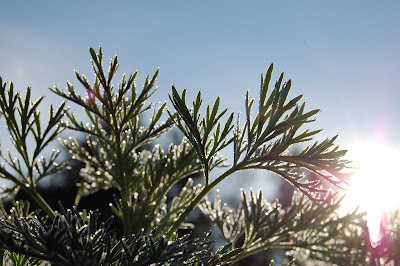 With many perennials the foliage helps to protect the plant from frosts. 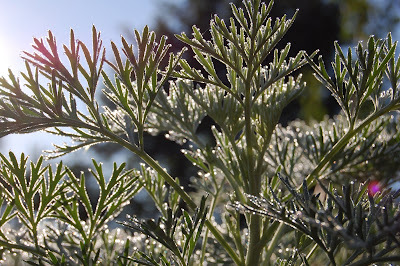 According to Floridata it is believed to be been a hybrid between Artemisia arborescens and Artemisia absinthium. ‘Powis Castle’ artemisia is very easy to propagate though stem cuttings. Find a piece of stem with two nodes and make your cutting beneath the second node. Pinch off any top growth in the center and leave only one or two leaves. The fewer leaves you have the less water it will lose which increases the odds of success. Dip the end of the cutting in rooting hormone and place it into your potting medium. Keep the cutting medium moist for about two to three weeks then check for resistance. Pot them up and grow them until they are large enough to plant in your landscape! Here is one of my rooted cuttings just before potting. There is only a tiny little root coming from the artemisia but it is just enough to get this plant growing. It began growing new foliage while still in its medium which is a good sign that rooting may have occurred. Here you can see the root a little closer along with the rooting medium still somewhat attached. I don’t wash it off since I would risk dislodging the newly formed root from the cutting. In this case I used a mix of sand and peat. Here is the top leaf node of the cutting. I pinched it back during rooting to encourage root formation by forcing the auxins (hormones) in the plant to work toward making roots rather than foliage. Once rooting occurs, foliar growth resumes fairly quickly.